The tree looks great Kitty, such a nice surprise! Buckeye Fudge has been on my list to try for a while, gotta get to it:@) Happy Christmas Week-enjoy! Your son is such a sweet guy for surprising you with the house and tree all trimmed! Congratulations on winning the darling ornament and the teapot from your friend is adorable! Does your fudge ever look good! Have a beautiful Christmas with your loved ones, dear Kitty. Oh Kitty, Mike is such a wonderful son to that tree for you. It's lovely and I'm sure it meant so much to you. Pretty Mac-Childs ornie on it. Lovely memories with your little angel and Baby Jesus. The buck-eye fudge sounds like a winner! Merry Christmas and Happy New Year to you Dear Kitty! I'm so happy that you have a tree up again Kitty, your son was kind to do this for you and the icicle lights look very nice outside. A piece of your fudge would go nice with a cup of tea later. What a sweet son to put up your tree and lights for you, Kitty. Your December teacup is very pretty and a cup of tea with the fudge would make a nice treat. 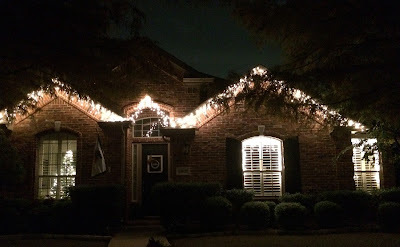 Loving all the decorating that your son did...everything looks great! I do enjoy Buckeyes...must put the ingredients on my shopping list. Thank you for the recipe! What a unique fudge. I have never had it. Your Christmas decorations are so pretty. Your son did a fantastic job. How sweet to0 do this. Loving that December teacup....It is gorgeous Kitty. Merry Christmas to you. How very thoughtful of your son to have put up the tree and the lights. Merry Christmas to you and your family. I used to live next door to a lady that was from Ohio and she made Buckeye's and shared them. :) I'm going to try your recipe. You have shared so many beautiful items here...love the December tea cup and the ornament! Mike is a sweetheart for putting up the tree and all the lights. Please tell him he's more than welcome to come over here and decorate next year! :) Your living room looks so warm and cozy and the flowers are beautiful. Sending hugs and love your way! I hope you have a blessed and very Merry Christmas! OH MY - what a sweet post...literally and figuratively! =) This fudge has to be so decadent. My mouth watered just looking at it and reading the recipe. Love the simplicity of it. I'm thrilled your sweet son put the tree up for you. Bless him! A very merry Christmas to you and yours too. This post was quite touching, Kitty. Your son is a dear! How very thoughtful of him to do all the decorating and it looks gorgeous. I love the lights in the window, stunning! He has blessed you richly. 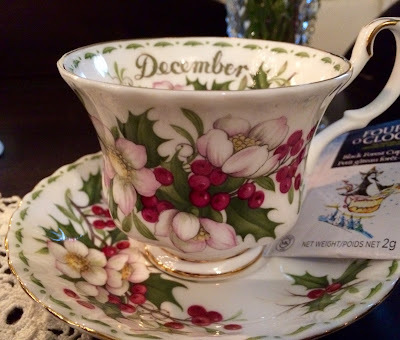 Love your December tea~cup! The fudge looks really delicious. I don't have a microwave (yep, really!) but think the recipe could be adapted. If I try it , I'll let you know. Your son has such a good heart ~ you must be so proud of him, Kitty. Wishing you both the most blessed Christmas. See you in the New Year! Oh how lovely your Christmas tree and lights look. Christmas must be bittersweet without your precious beloved. 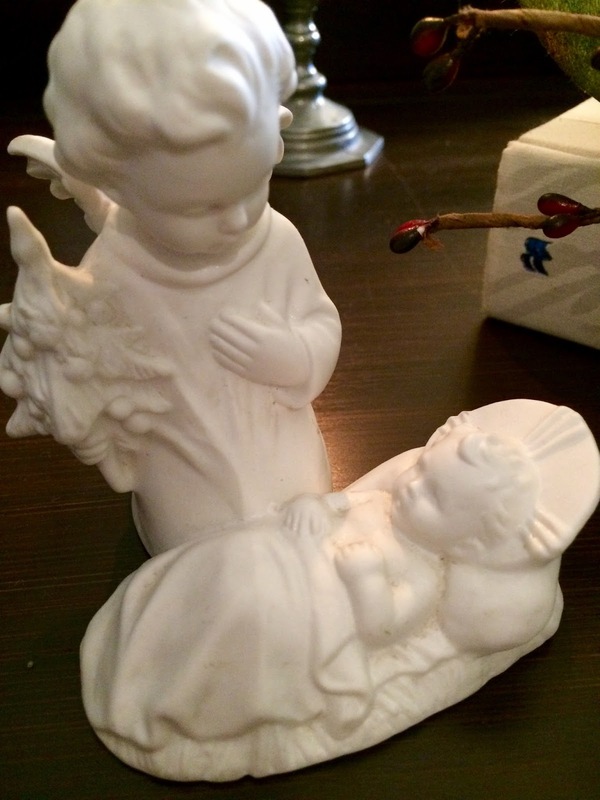 The Goebel angel and baby Jesus are beautiful. They make the heart go pitty-pat. May you have the most wonderful Christmas surrounded by your beautiful family, lovely Kitty,making precious and new memories. Dear Kitty, What a beautiful post filled with love!! Your son made your homecoming from your Thanksgiving trip a special surprise. How wonderful to find the tree up and lights displayed on the house. It is all just gorgeous. He is such a thoughtful and wonderful son. God's true blessings in our children can be seen when they do special things like this. Thank you for sharing this recipe. WOW it looks so delicious! LOVE your darling teapot set and cup. Just so pretty and how special to win the MC ornament. It looks amazing on your tree. Love your beautiful Goebel set too. What a treasure. 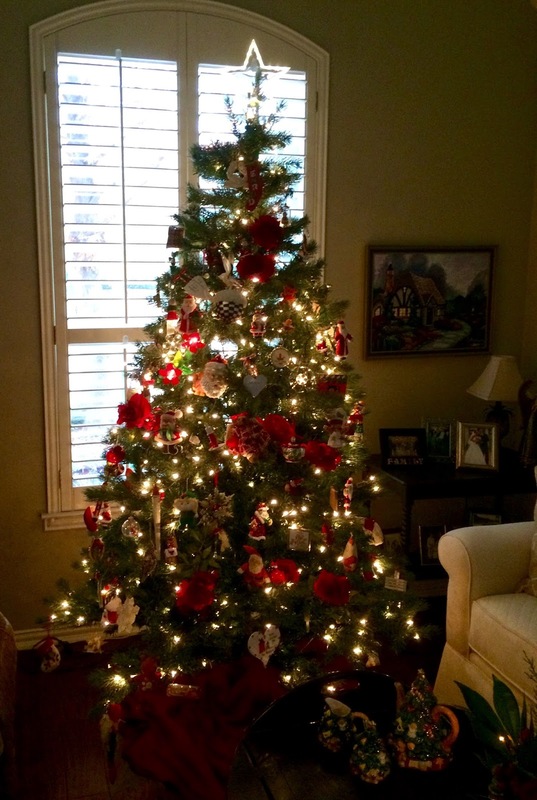 Kitty, what a fantastic Christmas setup you've got going this year - all the surprise decor (it's beautiful! ), and the treasured gifts - past and present. I hope you feel the love surround you of all those tokens, and token gestures. Merry Christmas! The fudge sounds fabulous Kitty, but the teaset and cup are soo soo pretty! How wonderful to come home to a decorated tree and a lighted house, I know your husband is looking down with a big smile. Merry Christmas Kitty! A very festive post Kitty - love that Christmas tea cup. 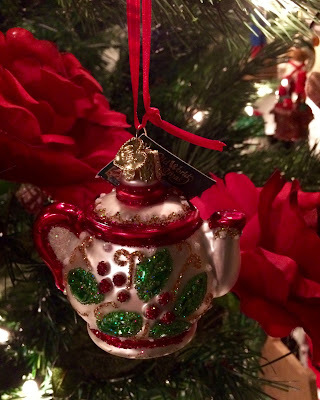 The glass teapot ornament is fabulous! Such wonderful images of Christmas, Kitty! You are blessed to have such a helpful & THOUGHTFUL son! (Rich would be proud of him) He did a great job, too. I'm guessing his back issues have improved since he was able to climb a ladder to do those icicles! Your December teacup is beautiful & the buckeye fudge looks yummy! Thanks for sharing the recipe with us. Oh this looks so good! 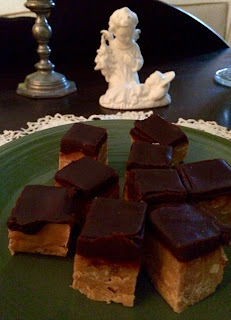 I love to have easy to make fudge recipes. 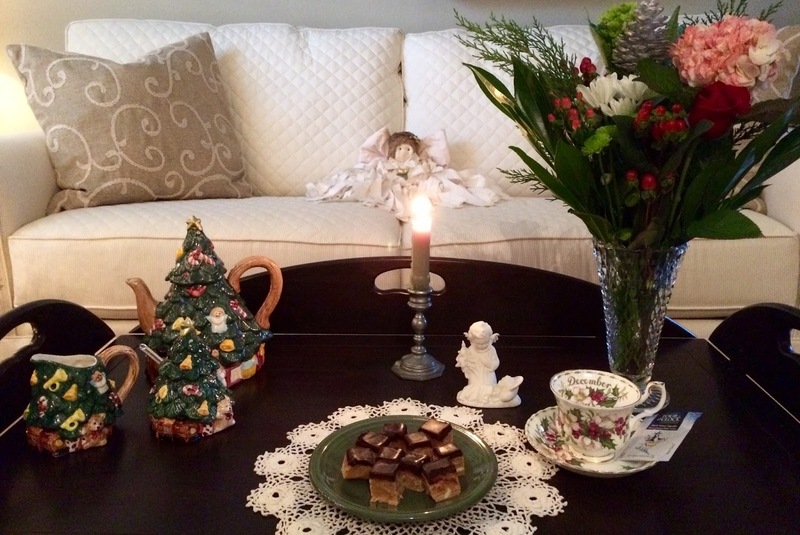 Your December tea party is so delightful, I always love to see your tea table setting. So absolutely touching that your son did the difficult things for you this Christmas, by putting up the tree and the lights for you! You are blessed to have such a caring son, but I know you know that :) Hugs to you today dear friend, and Merry Christmas to you! Love that wonderful son of yours - how sweet is THAT!!??? What a loving and kind gesture - he knew how much that would mean to you. Wow, you give him a big hug from this Buckeye! I also adore all your sweet gifts - new and old - such treasures! You planning on spending Dec 31st glued to the telly watching The Fiesta Bowl? I know I sure am going to be. GO BUCKS WHOO HOOOOO! I have a long to do list tomorrow and making Buckeye Fudge is one it!! I need to compare my recipe to yours - one of my favorite snacks. YUM. Wish it wasn't sooooo fattening. It's hard to eat only one piece, that's for SURE! Kitty, you are so blessed to have such a wonderful son as Mike. And, of course, he is to have you! Your fudge and all your lovelies look so inviting. Peach and joy! Freudian slip, I guess! That was supposed to be "Peace!" Kitty, your son was especially nice to do your tree and outside lights. That is tremendous! Your tea looks and sounds delightful. You serve up wonderful goodies each week. Congratulations on winning the M-C ornament! 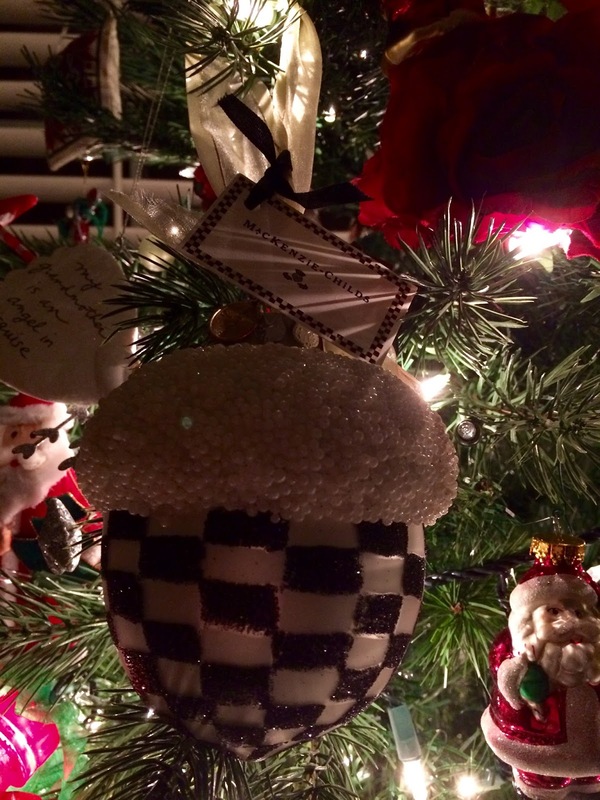 The black and white checkerboard pattern matches your blog perfectly! I'd love to own M-C, but haven't seen it around here. How sweet of your son to put up the Christmas decorations. It goes without saying that I love your teapot ornament. I'm so glad that you're enjoying the Black Forest tea. I recently received a sample of the Stash Black Forest so it'll be interesting to see how it compares to our favourite! What a darling teaset and great memory! Time goes so fast doesn't it! 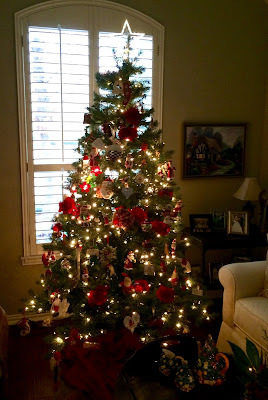 I love your tree and ornaments and thank you for linking and sharing. Merry Christmas! I've saved the recipe for the fudge. I think I need to try that as many of our friends and family enjoy chocolate and peanut butter together. It is much easier than making buckeyes! How sweet of your son to surprise you with all that decorating! A gift from the heart for sure. Love the tea set, the teacup, and the teapot ornament too! Kitty, it is easy to see that you are well loved. So many special things given to you! And what a wonderful son you have. My Ohio cousins would love the Buckeye fudge! Thanks for sharing with SYC. Dearest Kitty, Your home looks so lovely! So very glad to have met you through this medium we call blogging! Have a very Happy New Year! Oh, don't you have the sweetest son, Kitty! What a nice surprise and everything looks so beautiful. You have more than one sweet son to give you the darling Christmas tree tea set, too. It's those little things that mean the most in life.The fudge looks delicious! Love all of your keepsakes that you share with us and I hope to enjoy many more lovely posts in the coming year. I'm so glad we met through blog-land! Thank you for your kind visits. I hope you had a lovely Christmas and wishing you a 2017 full of sweet blessings. Kitty, I see you're still on a break, but I wanted to drop by and say Hello! Happy New Year to you too Kitty! Thank you for all your wonderful blog posts! Kitty, what a wonderful act of kindness your son gave you by bringing Christmas alive this year. Hope the new year brings you joy! Your post was featured on Full Plate Thursday. Thanks so much for sharing with us and enjoy your new Red Plate. Go Buckeyes lol. I've not heard of these before but OH I am SO pinning these! I make the buckeye candy at Christmas but these would also be great any time of the year and they're different with the nuts in, etc.